Meet the exhibitor - Boyne Brewhouse | Alltech Craft Brews & Food Fair. In the run up to this year’s event, we’re having a chat with some of this year’s exhibitors. First up, Sally-Anne Cooney of Boyne Brewhouse. She told us about how they’ve grown over the years, how they’ve changed and why you can’t beat a good can! Who founded the company and when was it founded? Boyne Brewhouse was founded in 2014 by the Cooney Family, so family is an extremely important part of the business. Leading the way is my father Pat Cooney who is a veteran of the drinks industry, my brother Peter looks after all our export sales, my other brother Patrick does our domestic sales, another brother James, the baby, is our accountant who keeps us all on the straight and narrow, then my role is everything from PR and marketing with a particular slant on our tourism visitors centre offering that we’ll be launching at the end of this year, although I’m also to get involved in production too. You mentioned one of your brothers manages export sales. Where do you currently export to? We’ve just begun exporting to the States which we’re very excited about. We have a container that went off to Australia just before Christmas, and then we’re also in a number of European countries from France to Italy along with Sweden, Lithuania, Poland and other countries, so our export business is growing steadily. How has Boyne Brewhouse developed and grown over the years? We’re extremely excited about the growth we’ve seen over the years. 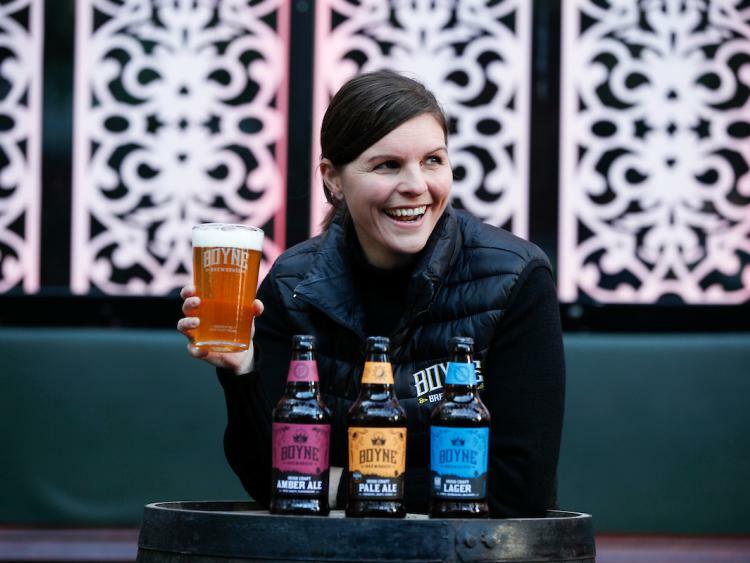 There’s huge opportunity in other markets outside of Ireland so we’ve focused a lot on exporting our beer, while here in Ireland we have a good presence both in the off-trade and the on-trade. Focusing on these parts of our business, along with many others, has helped us to become one of the larger craft beer brewers out there. Your beers have changed over the years in terms of both their names and packaging. Is this down to innovation, reacting to the market or both? A lot of it has been down to market research and feedback we’ve received. When we started originally we started with three beers and we were very much leading with the names of the beers. We also had very specific styles but we found this was lost in the names of the beers. So we decided to drop the names and put the beer styles front and centre, so you’ll see now we have a lager, an amber ale, an IPA and an American pale ale, so it’s very, very clear what style of beer we’re offering. Also, we launched with a see-through label which won us loads of design awards, but was hard to get them to stand out on the shelves which is so important. So we actually totally changed from our see-through label to a primary-coloured based range. We now have a different colour label for all of our beers and this follows through on everything. It also helps us stand out on the shelf which is very important for craft beers these days. In terms of the 330ml cans, this is following a popular trend in the US. We’re lucky in that we have our very own canning line, so we launched our cans in November. We currently have three brews in cans but we’re looking forward to adding this over the coming year. Also, it’s good to note that cans as a packaging material are really good when it comes to beer because you get total light exclusion so when you open a can of beer, you know you’re enjoying one in tip-top condition. If somebody is reading this and they’re not familiar with your beers, what ones are available? We have our core rane which is our 500ml bottle range. We have a lager, an amber ale, a pale ale, an IPA, an oatmeal stout and a saison. Then in our canned range we have an American Pale Ale, a Vienna Lager and a Session IPA and then we also have our limted edition Imperial Stout which is aged in our own whiskey barrels. This proved very pouplar at last year’s Alltech Craft Brews and Food Fair as it won three awards! Why are you returning to the Fair in 2018? It’s definitely one of the landmark events of the year for us. It brings our beers to craft beer enthusiasts so it gets us out front and centre to the right customers who turn out in droves every year for the show. We also love to catch up with all our friends in the industry which is always fun. Finally, any surprises for us at this year’s show? We have brews that we’re creating especially for the show but my lips are sealed on those for the moment!